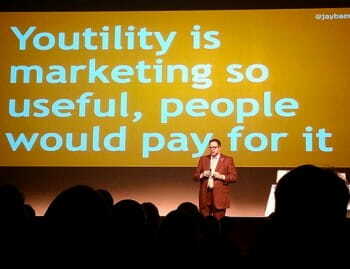 Youtility is one of Jay Baer’s most popular and powerful programs, and he has delivered it worldwide to B2B, B2C, small business, large businesses, technology-centric and technology-phobic audiences. It’s a smash hit because it’s relevant, resonant, practical, funny and true. 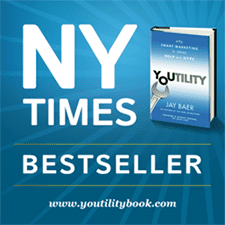 In Youtility: Why Smart Marketing Is About Help Not Hype Jay delivers a new approach that cuts through the clutter: marketing that is truly, inherently useful. If you sell something, you make a customer today, but if you genuinely help someone, you create a customer for life. Filled with dozens of real-world examples, this hilarious and powerful presentation will fundamentally change the way you think about your business, and is based on a New York Times best-selling business book. Jay also often conducts follow-up workshops/Webinars for event attendees, signs copies of Youtility and hands out free checklists of the key principles of the book. Jay will customize the presentation for your audience, including examples of people SITTING IN THE ROOM. Is your marketing so useful that people would pay for it? That’s what it takes to become a Youtility….and you can get there. Other options possible, ask Jay’s team! Check availability and options for bringing Youtility to your event. See Jay’s other programs: Talk Triggers, and Hug Your Haters.